Dark Wolf's Fantasy Reviews: A new edition for Gary McMahon's "The Bones of You"
A new edition for Gary McMahon's "The Bones of You"
Since I’ve talked this week about limited editions, printed and electronic books I would also like to point out another title hitting a wider market. Gary McMahon’s “The Bones of You” was released in 2013 by Earthling Publications in an edition limited to 500 numbered hardcovers and 15 lettered, traycased hardcover copies, but this month, DarkFuse has made available “The Bones of You” in both paperback and ebook formats. Unfortunately, so far, I didn’t get the chance to read this novel, but considering the tremendous work done by Gary McMahon until now I am certain that “The Bones of You” would successfully meet even the highest expectations. 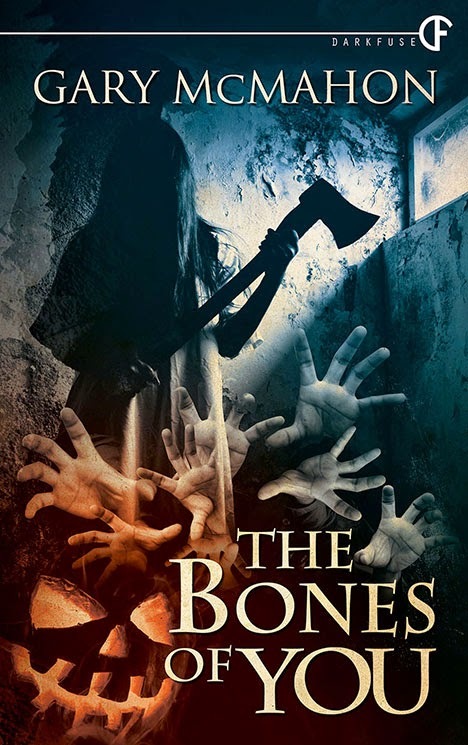 The cover artwork for the new edition is nowhere near as good as the one of the limited edition, Edward Miller’s cover is amazing, but that is hardly an impediment for the opportunity given to more readers of enjoying Gary McMahon’s “The Bones of You”. Adam Morris moves into a cheap rental property in the suburbs. He's divorced and now only sees his daughter, Jessica, every other weekend. He's a broken man trying to start a new life. When strange events start to occur in the run-up to Halloween, Adam suspects there's a link to the old, abandoned house next door. Soon he learns about a dead killer named Katherine Moffat and the terrible things she did to her victims in the cellar. As Adam uncovers more details regarding past events in the house next door, he realizes that he and Jessica might be in real danger. Before long, he is caught up in a mortal struggle to prevent the lingering influence of 'Little Miss Moffat' from destroying everything he has tried so hard to protect. This is a story about ghosts, a dead serial killer, and a man struggling to be a good father to his young daughter. This is also a story of pain and pathos, love and hate, abuse, addiction and desire.